HCM City (VNA) - Die Fledermaus (The Bat), an operetta by Johann Strauss II, will open the biennial Autumn Melodies arts festival in HCM City from August 19-27. The festival is organised by the HCM City Ballet Symphony Orchestra and Opera (HBSO) in 2005 to highlight classical music, opera and dance. 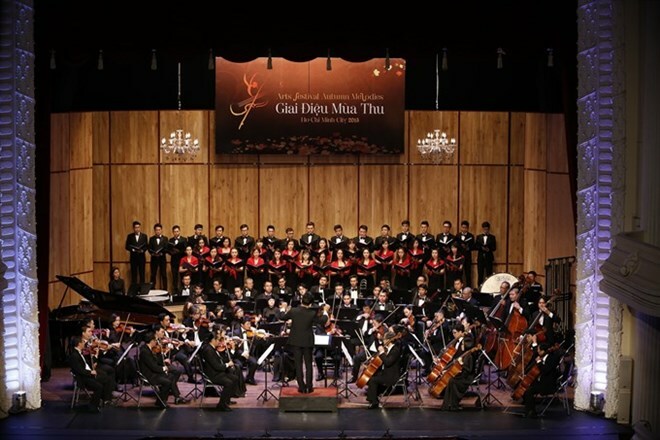 More than 200 Vietnamese and international artists will take part in 12 performances at the city’s Opera House. For the opening performance, HBSO and the Goethe Institute in HCM City have prepared for more than a year to stage Die Fledermaus for the first time in Vietnam. The operetta, set in Vienna in the 19th century, features Dr Falke’s plan to embarrass his friend Eisenstein who leaves him at a park after a costume party. The work’s libretto was written by German dramatist Karl Haffner and author and composer Richard Genée. First staged in 1874 in Vienna, it is regarded as the most celebrated and most frequently performed operetta. The Vietnamese version will be directed by German director David Hermann. German vocal master and conductor Askan Geisler is training HBSO artists to sing in the original language of German. The performance will feature Cho Hae Ryong of the Republic of Korea, Pham Duyen Huyen, Dao Mac, and Phan Huu Trung Kiet, together with HBSO’s vocalists, musicians and dancers. Conductor Geisler and HBSO conductor Tran Nhat Minh will lead the orchestra on August 19 and 20, respectively. On August 22, young Russian talents from the Maestro Foundation and the Spivakov Foundation will continue the festival with a concert. Young Vietnamese talents, pianist Nguyen Lan Anh and violinist Tran Le Quang Tuyen, will introduce works by Mozart, Tchaikovsky, Chopin, Prokofiev and Sarasate on August 24. The festival will include a performance featuring compositions for guitar on August 25, featuring guitarists Nguyen Thanh Huy of Vietnam, Anton Isselhadt of Germany and Pongpat Ponpradit of Thailand, and the Saigon Guitar Quartet. Musicians from the International Chamber Players and Vietnam National Academy of Music will present three concerts from August 23-25. The first, titled A Night with French Chamber Music, will feature compositions for piano and violin by Faubré, Debussy and Chausson. In the second concert The Eight Seasons with Vivaldi & Piazzolla on August 24, the artists will play with violinists Bui Cong Duy, Tran Huu Quoc and Vu Viet Chuong and American violinist Gregory Lee. The last concert, European Journey: Countries and People, will include works by Wagner, Dvorak, Liszt, Rachmaninoff, Glinka and Hummel. On August 26, HBSO will host a performance of contemporary Vietnamese music by Nguyen Manh Duy Linh and Vu Viet Anh, and a ballet Gone through Love choreographed by Nguyen Phuc Hai and Nguyen Phuc Hung. The festival will close with a special concert featuring violinist Hoang Tuan Cuong, German cellist Ulrich Horn and HBSO Symphony Orchestra. They will perform works by Brahms, Smetana and Tchaikovsky. The two concerts will be led by conductor Le Phi Phi, who lives and works in Macedonia. The festival includes two outdoor concerts on August 19 and 27, featuring the Brass Ensemble from HCM City Conservatory of Music.